Just as my latest Le Blanc 2014 and Le Rosé 2015 Pays d’Oc IGP Chartier, which were born of my newly acquired maturity as a producer, merchant and vintner—at the vine and in the cellar, and with the help of Bordeaux oenologist Pascal Chatonnet—, the 2012 vintage of my new red Fronsac Bordeaux is a prime example of this evolution, as were those 2015 rosé and 2014 white. Bearing new labels that reflect the importance of the terroir in my approach, this new “vigneron” Bordeaux vintage differs from the 2010 and 2011 vintages due to vine lots with a better location in the hills of the Fronsac controlled designation of origin (A.O.C.) as well as with a higher proportion of very old Cabernet franc vines, which bring elegance, fruit and brightness to the warmth and texture of the merlot. I’ve elaborated this wine with my partner in crime, Bordeaux oenologist Pascal Chatonnet, who is the owner of the Château Haut-Chaigneau in Lalande-de-Pomerol. The origin of the lots we selected, on the hilly terroirs of the Fronsac appellation, just a stones throw West of Pomerol and Saint-Émilion, as well as the stunning maturity, at least for this vintage, of the cuvées we assembled for this 2012 vintage, give this Bordeaux an unprecedented aromatic definition that is exceptional for its rank, as well as a fruitiness that is bright with ripe and extra fine tannins. Plums, red fruit, button mushrooms, white pepper and coffee all play a part in its aromatic profile. Just as my latest Le Rosé 2015 and Le Blanc 2014 Chartier, this Bordeaux wine is also more textured and generous than its predecessors, yet just as refined, perfumed and slender, with a subtle, long mineral finish that comes from the remarkable Fronsadais molasse soil—which is also found in the hills of the Saint-Émilion sector that yield some grands crus—on asteriated limestone. The cask aging (in one and two-year-old barrels) lasted only 12 months and we didn’t use new casks to avoid uselessly imparting some wood to this wine, allowing the terroirs to fully express themselves. I am truly proud of the high-quality we have achieved with this 2012 Fronsac Bordeaux! This marks a new stage in my career as an ever-learning wine producer, merchant and vintner. This right bank, more specifically from the Fronsac controlled designation of origin (A.O.C.) located just West of Pomerol and Saint-Émilion, dominated by the ever-seducing merlot varietal to which 10% of old-vine Cabernet franc bring distinction and brightness, with a fruity quite rich nose for its rank, a complex wine reminiscent of white pepper, button mushrooms, plums and roasting. On the palate, this wine has a multitude of flavours, it is full-bodied, with a nearly velvety texture that is augmented by a pleasant natural freshness and supported by an extra fine grain of tannins. Its final is long and marked by red fruit, spices and mushrooms that are doubled with a subtle mineral touch that is due to the remarkable molasse soil of the Fronsadais that is also found in the hills that yield some of the Saint-Émilion grands crus. This wine will age beautifully until 2021, maybe beyond. Undoubtedly one of the accomplishments of the 2012 vintage of this appellation. This wine comes from the very good but heterogenous 2012 vintage during which only the best hilly parcels ­ which is the case of this Fronsac—gave the best results. 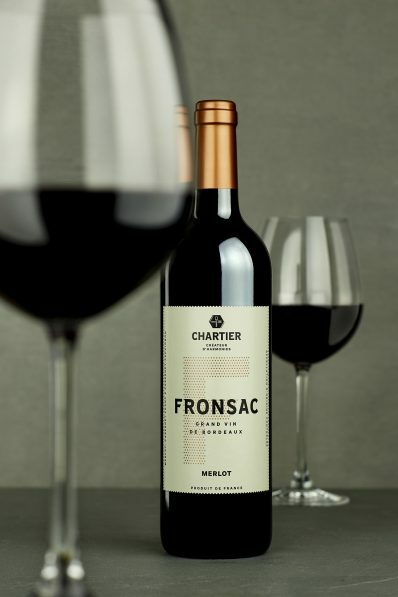 This new red Bordeaux differs from the 2010 and 2011 vintages of this Fronsac due to the selection of new vine lots with a better location in the hills of the Fronsac controlled designation of origin (A.O.C. ), just a stones throw to the West of Pomerol and Saint-Émilion, as well as with a higher proportion of very old Cabernet franc vines, which bring elegance, fruit and brightness to the warmth and texture of the merlot. The origin of the lots we selected, as well as the stunning maturity, at least for this vintage, of the cuvées we assembled for this 2012 vintage, give this Bordeaux an unprecedented aromatic definition that is exceptional for its rank, as well as a fruitiness that is bright with ripe and extra fine tannins. Plums, red fruit, button mushrooms, white pepper and coffee all play a part in its aromatic profile. Just as my latest Le Rosé 2015 and Le Blanc 2014 Chartier, this Bordeaux wine is also more textured and generous than its predecessors, yet just as refined, perfumed and slender, with a subtle mineral long finish that comes from the remarkable Fronsadais molasse soil—which is also found in the hills of the Saint-Émilion sector that yield some grands crus—on asteriated limestone. The cask aging (in one and two-year-old barrels) lasted only 12 months and we didn’t use new casks to avoid uselessly imparting some wood to this wine, allowing the terroirs to fully express themselves. Don’t forget the 800 recipes available in the four-volume Papilles pour tous! collection, many of which are on the aromatic path of this red Bordeaux wine. New recipes created specifically for this new Fronsac will also be available here soon.